Ted (Zac Efron), a young boy living in Thneeville – a self contained town where everything is predominately artificial – dreams of winning Audrey’s (Taylor Swift) affection. So, when she declares she’d marry anyone who brought her a living “Truffula” tree, Ted is led to seek out the Once-ler (Ed Helms), a poor old businessman whose selfishness prompted the devastation of the land’s trees, and the only person who can guide Ted to his target of winning Audrey’s love and restoring the world’s beauty. Adapted from Dr Seuss’ children’s classic, and brought to the screen by the team who came to fruition with last year’s runaway success Despicable Me, The Lorax hinges upon a culturally relevant battle between gluttony and the preservation of nature. However, for some reason, the screenwriters – Ken Daurio and Cinco Paul – have foolishly sandwiched this between Ted’s desire to win a young woman’s heart. It’s not that these issues don’t come through, but because of the convoluted way in which we’re lead to the heart of the film (the Once-ler’s story), the exposition and eventual conclusion are tedious and unnecessary in comparison, helped no less by Efron and Swift’s passive, uncharacteristic vocals. These elements are redundant to the true essence, just as redundant as, say, Rob Riggle’s evil Mr O’Hare who seems determined to stop Ted in his tracks and continue making money from the townspeople’s dependancy on his air-based products. When at its focal point, and in the throes of the Once-ler’s retelling of events, The Lorax comes into its own and is able to instil a smattering of enjoyment and wisdom in its hungry audience. The animation is boundless in its colourings and ability to evoke a sense of nostalgia towards a time of life that seems so ebullient and full of life (made clear by the colourful array of animals present, most of which are responsible for some of the films funniest moments). In his depiction of the Once-ler, Helms’ vocals do well in transmitting his older version’s remorse and younger version’s callousness. It’s Danny DeVito, though, who steals the show with his godlike take on the Lorax himself, the speaker of the trees summoned by mystical forces in an attempt to stop the Once-ler’s menace. Nevertheless, the tone shifts come all too easy, and our attention is constantly tested as the plot is driven forward at speed. 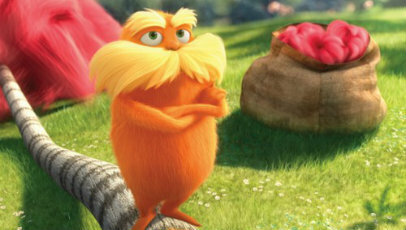 Through the writers’ silly attempt at formulating a love story to add a seemingly much-needed extra dimension to proceedings, an obvious lack of humour and an assortment of uninteresting and irrelevant characters, The Lorax stumbles drastically in its concentration and entertainment (laugh out loud moments are almost non-existent and the action shockingly limited). While director Chris Renaud’s experienced animation-orientated eye may account for some of its successes, the final product ends up being detrimental to a beloved story, and is at best only intermittently engaging. While the movie is funnier than the book, the drawback of this modernized version is that it loses the timeless quality of the story on the page. Still, I had a good time and it will definitely resonate well with plenty of adults and just about every kid imaginable. Great review.